In this day and age, it is as if everyone wants to be a full-time blogger. Thanks to the internet for flimflamming all of us with the easier-said-than-done classic millennial drivel that is: quit your day job and be your own boss. But for Noemi, the person behind the fast-growing travel blog, Pinay Flying High, it all came as a surprise. What was once a travel agent's personal online diary became a favorite online destination for practical travel advice. I think it's her candid personality that most definitely engaged her readers. On her blog, she talks from experience about the must-visit places, visa application walk-throughs, and satirical travel-related listicles like her top hit: Reasons Why Living in Dubai will Ruin Your Life. No nonsense and pure information — that's how she wants it. Pinay Flying High also opened a door for Noemi to give back to the community. She was still living in Dubai when she organized a charity event for the typhoon victims in the Philippines, which raised money and filled four boxes of clothes and medicines that were sent to the victims. "It was a humbling experience because I was able to build a bridge for them to help those who are in need." Below, she gave us the lowdown about "being her own boss" and her secret to self-employment success. What does your normal work day look like? As a blogger, my day varies a lot depending on whether the task that I need to complete is a freelancer task or a blog post. Now that I am trying to establish my blog here in London, I try to get out and explore the city at least twice a week to have something to write about. One blog post sometimes takes me about two days to finalize, which is funny because most people think that being a blogger is not a real job. To finish a blog post, I spend about seven hours sorting and editing of photos, doing a bit of research, and then finally writing the blog content. After the post has been published, I will create and schedule all the custom social media posts for my latest blog post. Surely, meeting people is the best part of my job apart from being able to do what I love doing. Through my blog, I have made so many friendships with readers, bloggers and PR persons alike. Being a blogger means that you are your own boss. But it also means that you are also your own employee. There is no set timing as to how many hours a day or week you need to work, and there's also no fixed salary. The amount that you get for every hour that you spend on your blog is definitely less than the per hour rate in a corporate office. Do you think you'll ever get tired of your job? I am certain I will never get tired of blogging. However, I do think that soon enough I would want to have a corporate job once again. For me, blogging is already a part of my life. No matter what I do, I will still keep blogging. What do you think is your one trait that allowed you to reach where you are now? I am very focused and organized. These are the traits that you need if you want to be self-employed. As a blogger or a freelancer, there's nobody to direct you where you need to go and you're creating your own path for yourself. If you're not focused, you'll never be able to get anywhere. And if you're not organized, you'll never be able to achieve any goals you've set for yourself. What's the one piece of advice you wish you'd known in your teenage years – life and career wise? Your job title does not determine your success and your social status. What matters the most is that at the end of the day, you love what you're doing and your job gives you a sense of accomplishment. Follow her on Instagram, Twitter or visit her blog. 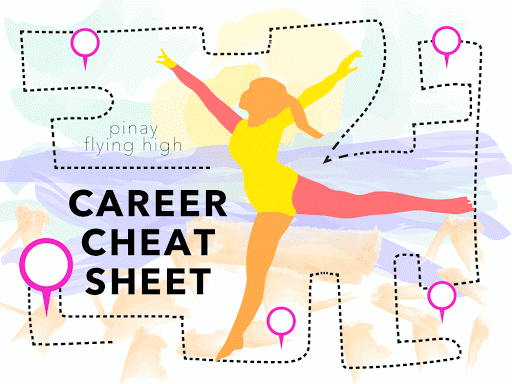 Read previous CAREER CHEAT SHEET installments here. Love the interview! To me, Noemi is a real inspiration on taking blogging seriously! Great job Bianca! All Rights Reserved. LILMISSBIANCA 2017.